our neighbors know better than to ask. they just quietly watch and wonder until we realize that we have an audience and begin explaining ourselves. one fall day, we discovered that our persimmon tree had a load of ripe fruit on it. there were lots of them on the ground but we could see all of the little fruits hanging on the branches and we wanted them…onto the ground went a large sheet and out of the tool box came a mallet. darry began hammering the trunk of the tree and as the fruit fell onto the sheet, i collected it in a bucket. it was a strange sight. i will admit if i was the one watching, i would wonder what was going on. 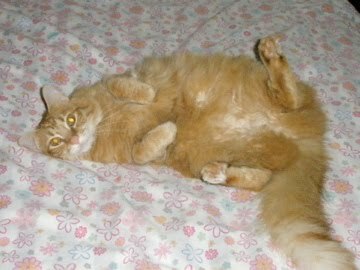 but it wasn’t me watching, it was my neighbor and he was rather concerned. it seems that he thought darry was using that mallet on me, on my head specifically. from his vantage point it looked that way and when he came over to check on me, we all had a good laugh. 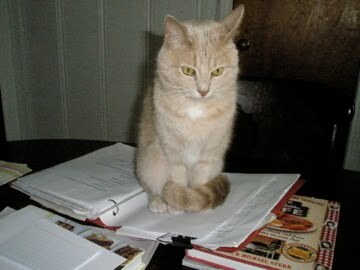 a southern baking book would not be complete without at least one good recipe for a persimmon dessert. since pie and pudding seemed so obvious, i decided to combine it with a few of my favorite things; caramel, pecans and warm cake. 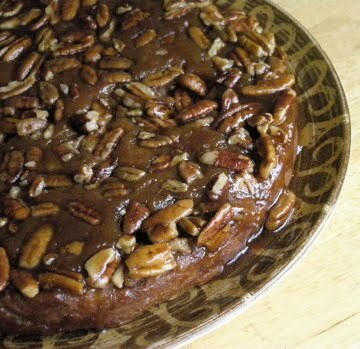 warm caramel glaze with a generous helping of pecan pieces will form the glaze and the top the cake as it is unmolded. since my supply of persimmon puree was a little thin, i decided to test recipes with sweet potatoes and only use the persimmon puree for the final test. 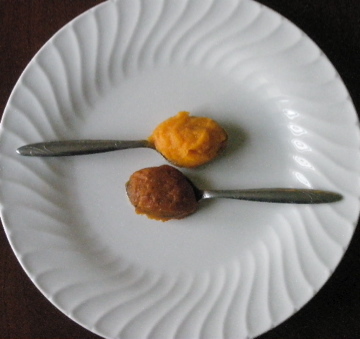 the top is sweet potato and the bottom is persimmon puree. 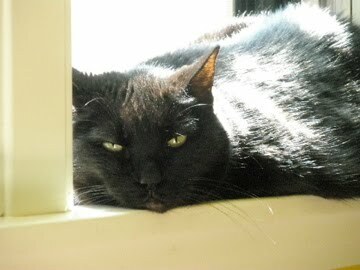 josie was thoroughly unimpressed with the whole thing and she wasn’t too crazy about today’s musical selections either.